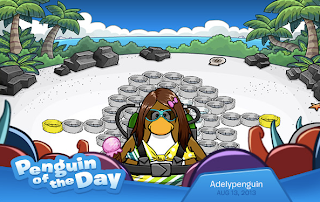 Club Penguin Cheats by Mimo777 Club Penguin Cheats by Mimo777: Penguin of the Day: Adelypenguin! Adelypenguin hosts contests and parties, and seems to be quite the artist – one of her igloo designs is a penguin made of puffle beds! So cute! Let Club Penguin know who you think should be the next POTD here! Yeah but wouldn't people find it annoying when people say they have a party? Why does this deserve penguin of the day?